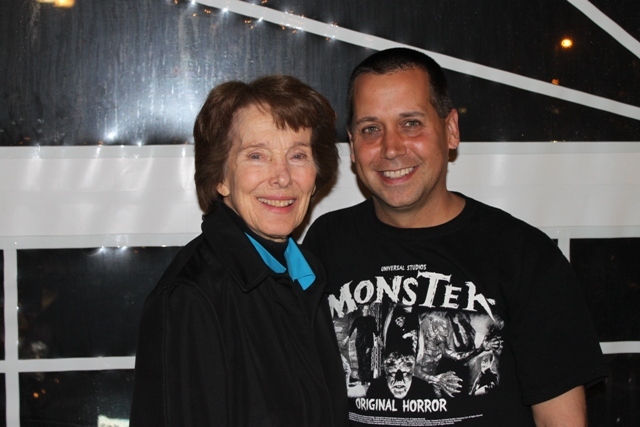 Meeting Julie Adams: “The Creature from the Black Lagoon” had good taste! When I was in Junior High School, I had an amazing art teacher named Mr. Ray. He was known for his quick wit, hilarious commentary, and a penchant for dropping unruly kids into an industrial-sized waste basket (Ah…the good ole days!). Mr. Ray also was a fan of horror films and, aside from boasting a 1979 ALIEN figure on his classroom shelf, would also host a “Horror Video Club” after school. If there was ever a good reason to be kept after class, this would be it! Our parents had to all sign a consent form as he’d be playing scenes from Rated R horror films, and it was he who introduced me to the prom night vengeance of CARRIE, the genius directing of Hitchcock, and other great examples of horror/sci-fi/suspense treasures. One of the scenes he made a point to show us was from The Universal classic, CREATURE FROM THE BLACK LAGOON. I am referring to the iconic moments of Julie Adams taking a leisurely swim across The Black Lagoon while, unbeknownst to her, the creature is below following her every stroke. “This is one of the most amazing, and even romantic, moments in a monster movie,” he told us. CREATURE FROM THE BLACK LAGOON, however, was one film I was already well acquainted with. Ever since I was a kid and watched it on The Son of Svengoolie show, I was always a huge fan of The Creature. I thought the design was amazing and to this day marvel at a how a virtually expressionless monster could illicit such incredible sympathy. The Creature was much more a misunderstood animal versus a terrifying monster, and this was one of the many reasons it still stands as one of the best. 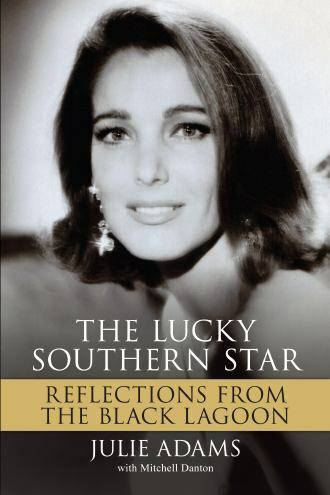 Both David and I grabbed a copy as well as our pictures of choice before finally meeting the classic “Southern” star. Celebrities are, above all else, “people” and, like all of us have their own personalities and “energy” that they bring to their fans. Of course many are “actors” and you can assume that a lot of them probably do their fair share of pretending to enjoy us, though many don’t mince words (see my recent Tippi Hedren story). Once we stood before the great Ms Adams, one was struck at her total absence of pretense. 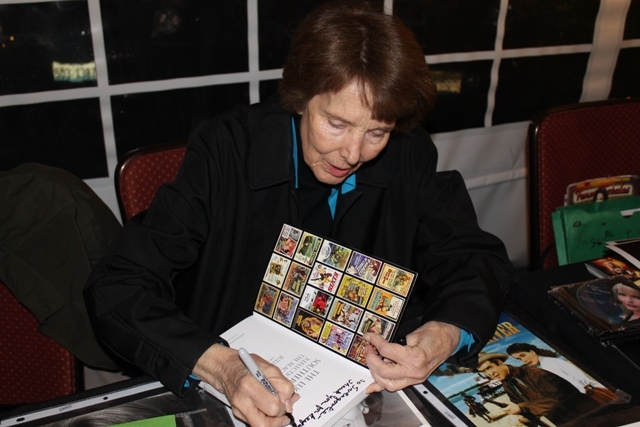 Both David and I agreed that Julie Adams was about the most genuinely gracious person you could ever meet – both in or out of a convention hall. In THE CREATURE FROM THE BLACK LAGOON, Adams plays Kay Lawrence, the soft-spoken and beautiful assistant to Dr. Williams (Richard Denning). Despite her attractiveness (which not only illicits the attention of both leading males but also appears to have a hold on a nearly extinct species of gillman), Lawrence has no ego about her and even goes as far as to unsuccessfully try and smooth over the tensions between Dr. Williams and her boyfriend, Dr. David Reed (Richard Carlson). This is the Julie Adams that many of us grew up watching in the film and, I am happy to report, is exactly what you get off screen as well. Her warm smile could disarm even though most cantankerous individual (like Dr. Williams) and, needless to say, both Daves immediately gushed over her. I also made a point to mention how I fully agreed with my old art teacher in that her swim scene was one of the finest witnessed on the Silver Screen, She was very appreciative and also appeared humbled by the comments. As that night’s festivities were beginning to wind their way down, we left her table each commenting on the way back to our room how positive the whole experience of meeting her had been. 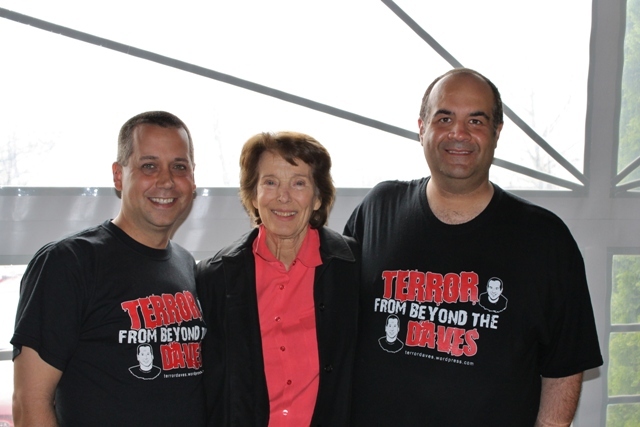 So much so, that we would return the next day to see her again and also buy an extra copy of her book for a friend of ours (one who also happens be showing THE CREATURE FROM THE BLACK LAGOON on national commercial TV these days, as well as being the man who introduced me to the film in the first place). Adams recently won a Rondo Award for being voted in their “Monster Kid Hall of Fame.” I don’t know which made us prouder; winning the award for “Best Blog” or simply having the honor of being on the same year’s list of recipients as Ms Adams. 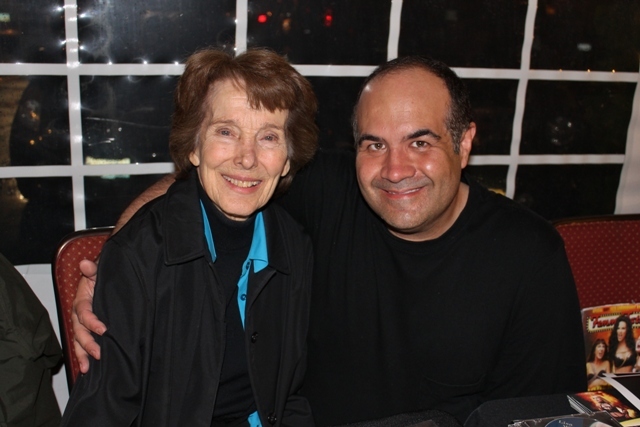 Yes, it’s true that The Creature’s love for her would prove every bit as disastrous as that of KING KONG’s….but after meeting the woman behind Kay Lawrence, I am convinced that there are definitely worse ways to go. 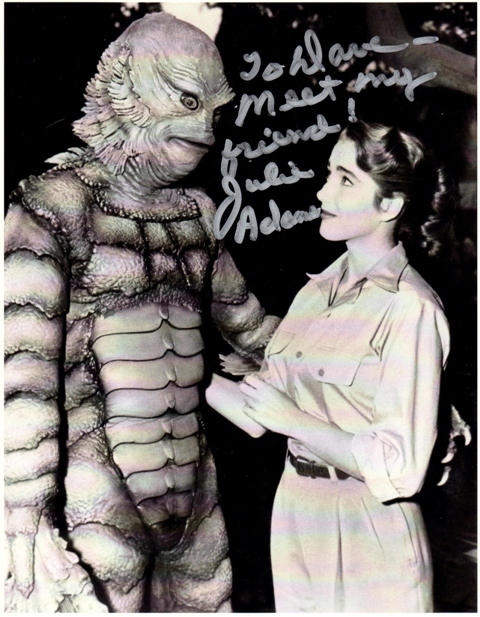 This entry was posted in Celebrity Encounters!, Convention & Expos, Monsters and tagged alien, Creature From The Black Lagoon, HORRORHOUND WEEKEND, JULIE ADAMS, Rondo Awards. Bookmark the permalink. ← Devoured by The Man-eater of Manayunk: Saturday Night Dead’s Stella Desire!